Like Ernest and the Magic School Bus before it, New Zealand's iconic Coastal Pacific rail line will ride again. KiwiRail has announced the train it will reopen on December 1, 2018. 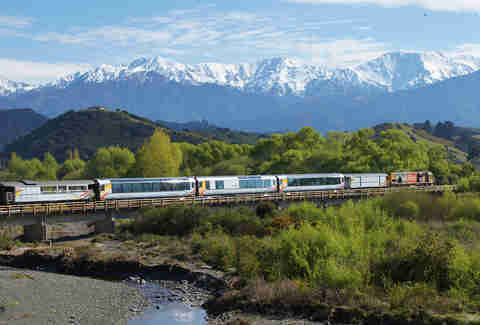 Running from Picton to Christchurch, the Coastal Pacific was put on hold two years ago after the railroad sustained damage during 2016's Kaikoura earthquake. The 7.8 magnitude quake destroyed roads, homes, and even sent some railroad tracks into the sea. The scenic route takes riders on a trek along the northeast coast of New Zealand's southern island, including 98 kilometers along the Pacific coast through 22 tunnels and over 175 bridges. The six-hour journey offers incredible views of the island's gorgeous landscapes. 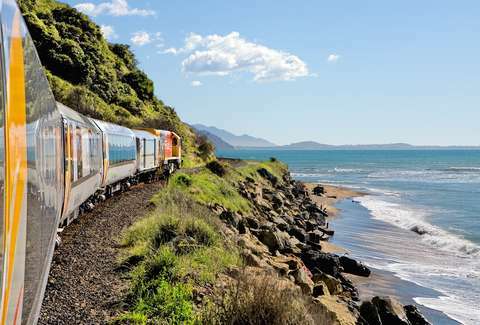 "We are delighted to confirm this well-loved service will be running again this summer, allowing thousands of travelers from around the world to once again enjoy this spectacular coastline by train," Alan Piper, KiwiRail's GGM sale and commercial, said in a statement. "We expect our services to fill up fast, particularly as many people will be keen to take advantage of the service to see the amazing job done to restore the road and railway line through this area." In addition to a view of the Kaikoura mountain range, your ticket includes a seat with panoramic windows and overhead views built for anyone looking to enjoy the landscape. There's also an open-air viewing car so you can be sure to get the Instagram pictures that will make your friends and family jealous. Tickets start at $104 for adults. The line is scheduled to resume service on December 1 and run daily (except Christmas Day) through the end of April.